Contains: twenty-seven ellipses with decimal, fractional and mm designations. Size range: 1/8" to 2". 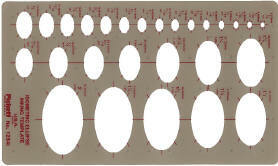 Inch and cm edge scales included, with built-in risers Size: 5-7/8" x 10” x .030”.